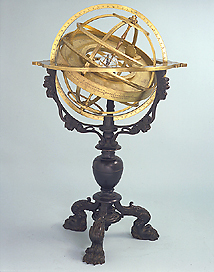 This large armillary sphere is made up of moveable brass rings, mounted between the meridian circle and the horizontal circle. The whole device rests on a heavy base of burnished brass with moulded, elaborate feet. A crystal sphere, placed at the centre of the rings, probably represents the aqueous part of the earth. The instrument is signed by Girolamo della Volpaia, son of Camillo and a maker of observational and measuring instruments, like the other members of his family.